Installation of Plastic Dumpster Waste Transportation Liners is quick and easy from inside or outside the container. Custom orders for containers of almost any size can be placed. Lengths can be made from 8' to 65' long, wall heights from 5' to 12' tall, and thickness' between 2.5 to 10 mils. Width is always standard at 92". The plastic dumpster liners are available in clear and black in full gauge or industry average. Dumpster Waste Transportation Liners are used in roll-off containers, end dump trailers, rail gondolas or lugger boxes. 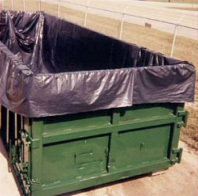 The Plastic Dumpster Liners provide excellent leak protection thus managing waste efficiently. Form-fitted design Guarantees easy installation and proper container fit. Greatly reduces tearing and punctures. Heavy-duty liners are made from a combination of virgin and recycled polyethylene Ideal for transporting bulk solids and sludges. All plastic dumpster liners are available in black.